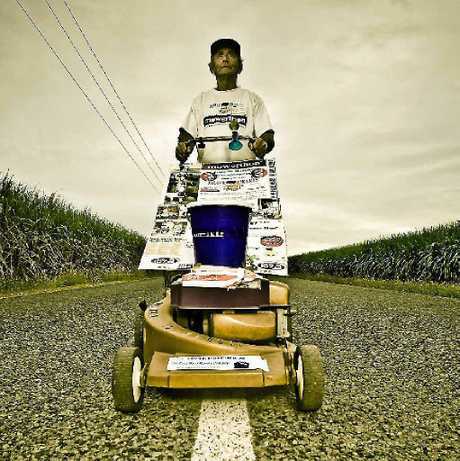 AUSTRALIA'S favourite lawnmowing man, Claude Harvey, will push his way through Gladstone this month during his latest mowerthon. The 68-year-old grandfather set out from Caboolture on May 27 on an epic 53-day journey taking him through 30 towns, in a bid to bring his fundraising total for Bravehearts to $700,000. Claude aims to raise $50,000 for Bravehearts, a charity which offers counselling and support to Australian children affected by sexual assault. "My ultimate goal is to raise $1 million so this wonderful organisation can continue to offer its vital services to Australian children in need," he said. "I look forward to meeting fellow Queenslanders on my trip, promoting Bravehearts services and ensuring children in these regional communities know that Bravehearts is there to support them and their families," he said. Government statistics sadly reveal one in five Australian children (59,000 per year) will be sexually assaulted before their 18th birthday - a statistic Bravehearts aims to halve by 2020. This trip adds to Claude's previous endeavours, including a gruelling 105-day mowerthon from the Gold Coast to Townsville in 2013, a 77-day trek from Mt Isa to the Gold Coast in 2012, where collectively he raised more than $178,000 to aid Bravehearts' education and counselling programs. Bravehearts founder and chief executive Hetty Johnston said Claude's ongoing efforts to help the organisation make Australia the safest place in the world to raise a child were incredible. "He is a national living treasure and I encourage everyone to get behind him on his latest mowerthon in Queensland," she said. Bravehearts provides counselling, education and other services for children and their families affected by sexual assault. Claude will be in Gladstone on July 13 and 14.